The Winner of IMGA China "Best Quickplay Game" is.... — Welcome to the GameSalad forum! January 2017 edited January 2017 in Announce Your Game! A total of 1300 games were submitted to the 1ST IMGA China and an on line panel of 200 game reviewers selected the 100 nominees. Then, on January 9th and 10th, a panel of jury (20 Chinese and 5 western mobile game experts) got together to play and select the winner: The Winner of "Best Quickplay Game" is Roll Turtle! It's a great honor to receive this award, thank you very much all the judges and friends who like this game. I have been a full time Indie Developer since 2014. I quit my regular job to create "Roll Turtle". At that time my son was born, he gave me the courage and inspiration to create something for him. Special thanks to my wife for her support. I did all the development on Roll Turtle except for the sound design. I never wanted to say that I'm a one man Indie developer, because without my wife and baby, I could never of completed Roll Turtle. (Although my baby frequently climbs on my lap and wants to type on the keyboard... this drives me insane). As a family, we push Roll Turtle forward, we adventure together, travel together, laugh together, cry together, we setup the monitor together, carry laptop in the rain, we pulled luggage, stroller and equipment in the sun, we participated in Causal Connect Asia 2015, Tokyo Game Show 2015, Taipei Game Show 2016...etc, we've been through all of this together. Roll Turtle filled me, my wife and baby with love and memories of the past 2 years. This is my life's most precious treasures, thank you all guys like this treasure. Thank you Gamesalad forums guys support. @kirafu Wow! That's fantastic. Congratulations. That is amazing. Quite the achievement. That is awesome! Congrats! Hard work pays off. Congratulations! this really fuels us to keep making games! Fantastic news! - and well deserved! - If it's not cheeky, I'm very interested in knowing it Roll Turtle is now earning enough to have justified quitting your job, in comparison? @kirafu, I am so happy for you! Well deserved! Fantastic, you deserve it!!! What a great award to get. Woah! You lucky Dzzztard! Kudos! Awesome news! you deserve it! Congrats. Great to see your hard work has paid off. I totally agree with you. Interview it's really great! well done @kirafu .. how many downloads now? Thank you guys for continuing to care about this game, I think here is the only place in the world where the remaining stay is still concerned about Roll Turtle. 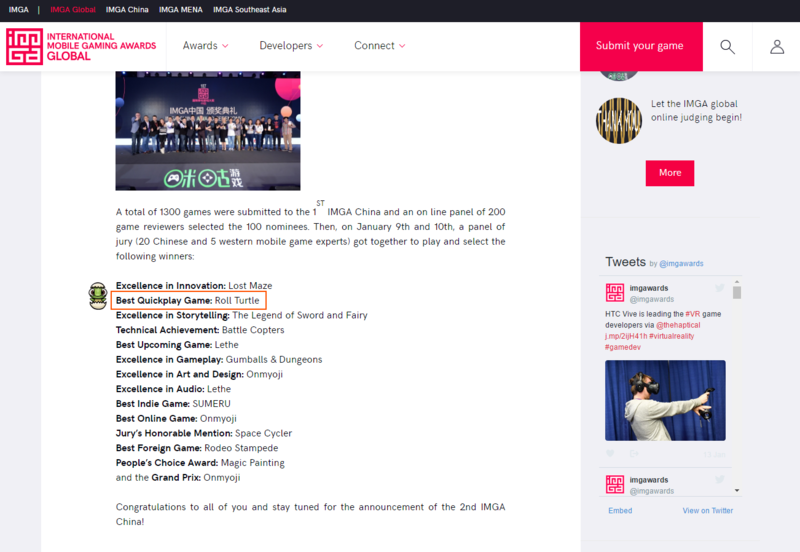 People are curious about whether there is an increase in downloads, honestly, the amount of downloads is almost no increase, It is certainly honored and happy to win the IMGA award, but there is no exposure in the other place about IMGA winner game, except for this forums. Only 0 to 1 downloads a day(like this:0,0,0,1,0,0,0,2,0,0,1,0). It’s such a let down. Such a beautiful game… and no one was downloading it. I finally started to get used to the number of downloads for the game. I accepted them for what they were. It's like a wound that engraved in my heart, I persuade myself not to think about it again, but that is very difficult, it is a combination of love and pain. EXPOSURE and MARKETING is the biggest difficulty, I have no way to let players know Roll Turtle, even it gets many awards, no one sees it, no one knows the existence of this game, it does not make any sense. No player to talk about this game, except for a few posts here. I want to post Roll Turtle dev story to Reddit, may cause people's interest, but I do not know how to post, where to post, can anyone help me? If you know how reddit works. I'm going to sell the house and move, to keep develop game work. Here is always able to heal my pain, a lot kind words and genuine support. Let me know if you have any things you want to know, thank you guys. Sad to hear! What are you working on nowadays? Do you have a new project in the works? however, you need to expose yourself more. You have a great game and lots of rewards! Shout it out more! For example, I see that your last post on TouchArcade was in August of last year! TouchArcade is no silver bullet, but every little thing helps. Especially since you have great comments and positive reviews on that forum. Use it. Post a new funny cartoon with your characters once a week! Build some hype. Make people care. Have you written to editors, e.g. Appspy? Tell them about your long list of awards. Go through the list of youtube Let's Players which @BigDave posted! Make a personalized cartoon for ones you like and write to them. Maybe they will play your game on stream. @kirafu, wish you had better downloads, it's such a hard market to get any real exposure in. If you want to post your story on Reddit, I suggest doing it at least the game dev section (https://www.reddit.com/r/gamedev/), I've seen many other developers post detailed stories about their experiences there and they usually seem to get pretty good traffic. I think we all understand your pain. It must be very hard to see that after so much work. I don't have any marketing skills. You seem to have done all the right things!!! You could use Roll Turtle on a job application and work for a development company?? Indie app development environment is very bad financially at the moment. The app stores really control what games get exposure. Of course I have followed your story and read all the articles and have your game. I can only hope the best for you and your amazing family. If there is anything I can do personally just PM me. Its tough business to make a living. Keep this in mind, your next game will have better launch (In theory) as you already have an established user base, awards. Opportunities for cross promotion become possible. It was featured on the App Store more than once, people knew it existed. Do you want some honest advice, it might not be as comforting as being told your game is great (and it is a really well made game), but I think it could be useful ? @kirafu Have you considered taking it to a publisher? I'll PM you some ideas and info on how to go about it this weekend. Agreed, that might be a good way to go. Perhaps query @RossmanBrothersGames, as they are having their game published through a publisher. Not sure if they found the publishers or vice versa, but worth asking. Sorry for delay to update the reply, thank you guys for your comment. @pHghost @PhilipCC I recently read a lot of books on different themes, such as "The Writer's Journey", because I want to create a story game. And play some games I have never been interested in. And I will move to another place with my wife and kids, and now there is no new project idea, hope this year there will be. I saw the @RossmanBrothersGames new game, that's really great! But "Roll Turtle" is not need a publisher because its already released, people will not be interested in a game that has already been released, I have to move forward, time to move forward. @Hopscotch Thanks for your suggestion, I tried to write to the editor of the touah arcade but did not get a response.I decided to proceed from what i could do. just a while ago I found a player who create Roll Turtle perfect clear all level walkthrough youtube video, I decided to share it here and touch arcade, hope its can be help everyone perfect clear Roll Turtle, and let more people know this game, this is not for money, just want to finish something, do these things make me feel happy with internal peace. @jamie_c Thank you, I will try, I have always wanted to post in reddit, but I feel a bit difficult, do not know how to start. @Toque how sweet of you! I truly appreciate it. @Two.E Thank you for your encouragement. Thank you! @Socks I sometimes think about it, this game maybe is not really good, or at least not as good as I thought, but why Roll Turtle won IMGA Best Quickplay Game Award, I can not figure out reason, It makes me confused. Thank you guys reply and advice! your comment always touches my heart, thank s again. As usual, let me know if you have any things you want to know, thank you gs family.